The earliest photosynthetic organisms on Earth were likely colonies of cyanobacteria, believed to have been on our planet 2700 million years ago by the existence of fossil stromatolites. The first evidence of land plants emerging comes by way of fossilized spores dating back to the Ordovician Period, 510 - 439 million years ago. Early photosynthetic land organisms probably resembled modern algae, cyanobacteria and lichens. Bryophytes such as liverworts and mosses, then developed which were nonvascular plants lacking seeds. The first vascular plants with stems and roots, date to the Early Siluraian Period, 425 million years ago. By the Devonian Period, 408 to 362 million years, terrestrial plant life is well-developed. The first real trees and seed-bearing gymnosperms are developed by the end of this era. Devonian forests are known from fossil deposits in New York, U.S.A.. A little later, the coal forests which date back to the Carboniferous Period, leave behind a plethora of spectacular plant fossils displaying an abundance and diversity of flora. During the Carboniferous Period, a large portion of Europe and North America was on the equator. The warm and consistently humid climate was ideal for the growth of extensive swampy forests. The Paralic Basin was the largest Carboniferous basin which comprised regions of what are now Ireland, England, northern France, Belgium, The Netherlands, Germany (Ruhr District) and Poland. Periodic changes in the sea levels caused the rivers that traversed these forests to flood, depositing massive amounts of sand and mud thereby burying the forest along the banks. In a period of one million years, several thousand meters of sediment would be deposited, densely packing and pressing the abundant vegetation into flattened rock fossil impressions. The most common vegetation in these forests were Sigillaria and Lepidodendron. Lepidodendron and Sigillaria are lycopods, or more commonly known as club mosses. They belong to the lycophytes group, today only represented by a handful of small herbaceous forms. While they were giant tree-sized plants, Lepidodendron and Sigillaria are not actually classified as trees but are very unique types of plants that died out hundreds of millions of years ago. Both grew to amazing heights exceeding 100 feet with stems over 6 feet in diameter! Their branches were draped with long, grass-like foliage of spirally arranged leaves and cones containing spores. Lepidodendron is famous for its unmistakable scale-like bark. The plant was anchored at the base not by a deep root system, but by several shallow running Y-shaped branches called stigmaria. The upper branches at the top of the plant terminated in cigar-shaped cones called Lepidostrobus. Depending on the specific species of Lepidodendron, these cones contained either small or large spores, or both. The presence of Lepidodendron fossils suggest a very hot and humid environment existed where they once thrived. Angiosperms (flowering plants) evolved during the Mesozoic, and flowering plant pollen and leaves first appear during the Early Cretaceous, approximately 130 million years ago. Plant fossils can be preserved in a variety of ways, each of which can give different types of information about the original parent plant. These modes of preservation are as follows. - Adpressions (compressions - impressions). These are the most commonly found type of plant fossil. They provide good morphological detail, especially of dorsiventral (flattened) plant parts such as leaves. If the cuticle is preserved, they can also yield fine anatomical detail of the epidermis. Little other detail of cellular anatomy is normally preserved. - Petrifactions (permineralisations or anatomically preserved fossils). These provide fine detail of the cell anatomy of the plant tissue. Morphological detail can also be determined by serial sectioning, but this is both time consuming and difficult. - Molds and casts. These only tend to preserve the more robust plant parts such as seeds or woody stems. They can provide information about the three-dimensional form of the plant, and in the case of casts of tree stumps can provide evidence of the density of the original vegetation. However, they rarely preserve any fine morphological detail or cell anatomy. A subset of such fossils are pith casts, where the centre of a stem is either hollow or has delicate pith. After death, sediment enters and forms a cast of the central cavity of the stem. - Authigenic mineralisations. These can provide very fine, three-dimensional morphological detail, and have proved especially important in the study of reproductive structures that can be severely distorted in adpressions. However, as they are formed in mineral nodules, such fossils can rarely be of large size. - Fusain. Fire normally destroys plant tissue but sometimes charcoalified remains can preserve fine morphological detail that is lost in other modes of preservation; some of the best evidence of early flowers has been preserved in fusain. Fusain fossils are delicate and often small, but because of their buoyancy can often drift for long distances and can thus provide evidence of vegetation away from areas of sedimentation. Today, there are some plants that seem to have eluded time and remain unchanged despite hundreds of millions of the Earth's history. 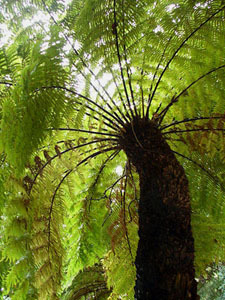 Ferns have been around since the Mississippian and conifers since the Pennsylvanian. There are even some species that are still alive today and are true "living fossils". Many cycads such as the Sago Palm, have appear nearly identical to those found in the fossil record of the Paleozoic! The Dawn Redwood (Metasequoia glyptostroboides) alive today is the same as those found in fossils dating to the Late Cretaceous, the time of Tyrannosaurus rex's rule!